As issue plays go, “Children of a Lesser God” has sprouted a brand new one. Back in 1980, Mark Medoff’s play was all about an instructor-therapist who can’t fathom the silent reality of the deaf female student he loves, marries and ultimately loses. It reverberated with one man’s fear and guilt once he steps outside the comfort zone of being in the majority. 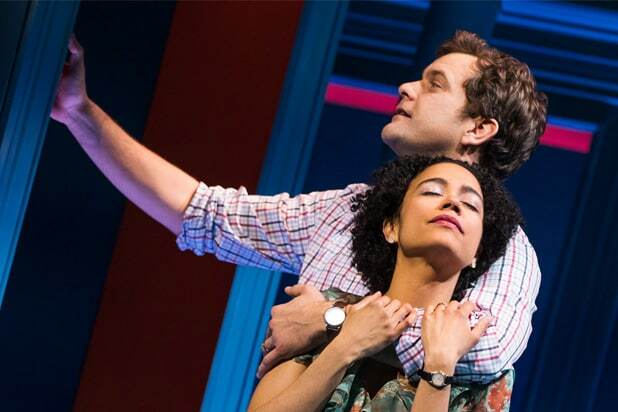 The first Broadway revival of “Children of a Lesser God” opened Wednesday at Studio 54, and the mutual but very different frustrations of the deaf Sarah (Lauren Ridloff) and the hearing James (Joshua Jackson) are again on full display. But something else is also apparent all these years later. In the original Broadway production, John Rubinstein’s James came off merely brash for aggressively pursuing Sarah. Director Kenny Leon has wisely kept the revival set in the post-Vietnam War era. Back in the 1970s, college instructors routinely dated, slept with and sometimes even married their students. Today, James’s behavior is downright creepy, and he’d be fired before ever getting to take Sarah to the altar. It doesn’t help that his climbing a tree and sneaking into her dorm room window is awkwardly staged. Even on the page the scene is embarrassing to read. In Act 1, James doesn’t pay for this gross infringement on a woman’s privacy. Leon and Jackson attempt to make up for that error in Act 2, with plenty of help from Medoff, when James suddenly carries way too much guilt for his many sins of political incorrectness regarding the deaf. The abrupt emergence of the #MeToo movement may be the least of the play’s problems. In the intervening years, the Deaf West Theatre has presented far better ways for non-speaking actors to perform on stage. At its heart, “Children of a Lesser God” is a two-hander with one actor doing all the talking. Medoff’s play keeps telling us to let the deaf communicate for themselves, and yet out of necessity James keeps talking for his beloved Sarah. Leon does introduce projected titles above the stage. We read as well as hear all lines spoken. The problem is, when Sarah uses sign language the titles don’t tell us what she’s saying. The titles read “Sarah signs.” Deaf audiences can now follow all the dialogue, but the rest of us are back where we started. “Children” might not exhibit all the limitations of a two-hander if any of the supporting characters were develop beyond a mere stereotype, each of which can be described with a single adjective: the rigid administrator (Anthony Edwards), the distant mother (Kecia Lewis), the lovesick student (Treshelle Edmond), the rebellious student (John McGinty), the insensitive lawyer (Julee Cerda). Ridloff successfully projects the beautiful enigma that James loves but will never fully know. Rubinstein won the Tony Award for playing James and Jackson, making his Broadway debut, may have a shot at the prize too. I found the herculean task of one actor essentially playing two roles an exhausting challenge the first time around, much less the second.